All cats love to have shelter away from adverse weather conditions and other animals who may be out there. You may wonder why you would want to buy your cat their own home rather than just letting them come inside. Well, cats are highly independent and territorial. A cat home gives them a place to call their own away from the potential stresses outdoors. Alternatively, you may have feral cats in your area, and you want to give them a place to shelter. 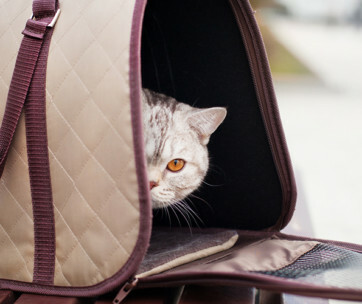 With so many different options out there, it can prove to be somewhat of a challenge to choose the ideal cat home for your four-legged friend. To allow you to make the most informed decision possible, we have selected 10 of the best outdoor cat houses and listed their most appealing features. Ready to put a roof over your cat’s head? Then let’s find one! 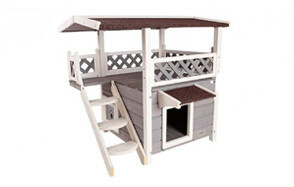 First up on the list, we have this truly beautiful two-story outdoor cat house. The bottom area is enclosed for protection, while the upper terrace lets your cat enjoy the outdoors, which means they still having the protection of the asphalt roof if the weather takes a turn for the worse. Since it is such a large structure, it is perfect if you have multiple felines. You don’t have to be a DIY expert to assemble the house and the holes are all pre-drilled. Once it is set up, the house provides a stable abode as the wood is made of anti-rot material to stand the test of time. This outdoor cat shelter offers both comfort and protection from bad weather conditions. There is a pair of entry and exit points, so your cat can decide how they would like to get in and out, and they have a means of escape if needed. This is the kind of outside cat house which is durable and tough enough to stand the test of time. It also comes with a manufacturer’s warranty for added peace of mind. As for the assembly, it is straightforward, and no tools are required. 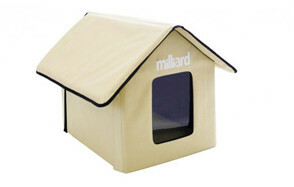 If you are looking for an insulated outdoor cat house, this one is designed to keep your feline friend warm. The floor, walls and roof are all contain high-quality insulation, ensuring that the structure stays cool in the summer and warm in the winter. You can also adjust the lifting handles to alter the ventilation. As for the unique door design, it allows your cat to enter, while still offering protection from predators. As well as being made from recycled post-consumer content, it is also designed to never chip, crack or fade. If your cat loves climbing up to high places, this three-story outside cat shelter gives them the opportunity to do this. And you are bound to get some joy seeing them poking their little heads out of the hinged shutters and peekaboo openings! The roofing is rainproof to ensure that your cat stays nice and dry, while the raised plastic floor keeps air circulating to ensure that the floor remains comfortable. The large door at the rear offers quick access and easy maintenance. This outdoor and feral cat house is easy to assemble, so you can put a roof over your furry friend’s head in no time at all. Inside is a heated bed which is designed to keep your kitty warm, no matter what the weather is like outdoors. 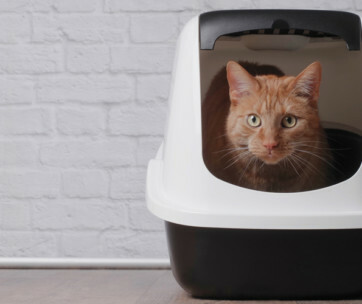 The heated cat house features two clear door flaps, which are removable depending on whether you are trying to encourage airflow or keep the heat inside. For added peace of mind, you can rest assured that these houses have been certified to USA/CA electrical safety standards. 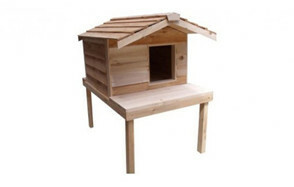 One of the major advantages of this wooden cat house is how easy it is to assemble. There are two escape points which ensure that your pet is not going to get trapped by predators. The wood is made from an anti-rot material which is designed to last at least three years. However, if you have a particularly destructive pet, they can end up causing damage to the house. Bear in mind that it is designed to fit a single cat under 15 lbs. Designed for both winter and summer usage, the wood used in the construction of this cat house is cedar, which is meant to stand for a long time. You can be certain of high-quality workmanship and materials. When the sun comes out, the lounging deck provides the ideal spot for your cat to catch some rays! As for the floor, walls, and ceiling, thermal-ply insulation has been placed inside for heating and cooling properties. This heated outdoor cat house is designed to warm to your pet’s body temperature using only 25 watts when your cat lies down. The design may look simple but it is also effective. The structure has the major plus point of being easy to assemble. Large enough to fit any cat, it is also a highly portable, and you can put it in a range of different locations including the garage, shed, porch, or anywhere else you would like to protect your cat from extreme temperatures. This outdoor cat house for winter and summer has a host of positive qualities including being light and durable, as well as insulated and waterproof. Since it only uses Velcro and zips in its assembly, there are no tools required, so you can put it up in no time at all. Dual openings ensure that your cat won’t get trapped inside. The door flaps are removable and transparent, so your four-legged friend has a view of the outside world no matter what. The unique igloo design of this outdoor cat house is made to direct any rain or snow away from the entrance. Also, the plastic surface stops flea and mold growth. Inside is a cozy carpet which offers warmth, as well as encouraging scratching. No tools are required in the assembly. All you have to do is snap together the sides. An alternative usage is a shelter for an indoor cat who wants a little home to hide and sleep. So, you have read through the product selection and think that you have the ideal cat house chosen? Before you make your final decision, there are some key considerations which are worth bearing in mind. After all, you don’t want to have to go through the time and effort of putting up the cat home, only to find that it is simply not right for your feline friend. Here are some important factors to bear in mind. First, look closer at ahat sort of materials have been used to make the cat house. You need to match the materials to the environment that the house will be put in. For example, if you live in a particularly humid place, you should avoid wood which will expand and contract. And if you are in a hot climate, you should watch out for plastics which are more likely to overheat. Of course, the house still needs to offer a decent level of protection from the elements like rain if it will be sitting in your backyard. If you plan on putting it in a covered area such as a porch, you can be more confident in choosing a fabric-coated option. This is also the more suitable choice if you would like to bring the home indoors from time to time. The ease of assembly may well have an impact on your decision-making process – particularly if you are not all that skilled in the art of DIY. It is also worth looking at whether or not you are going to need any tools as you will need to consider how you are going to get your hands on these beforehand. There are also those cat homes which are easy enough to seal up with zippers or Velcro. These are ideal if you need to put your cat home up in a hurry and don’t want to go through the confusion and risk of breakage that a tool-based installation is likely to bring. If you live in an area which is particularly cold and miserable, you may need to investigate heated cat homes. It is worth confirming the energy needed for the heating pad to run effectively. Alternatively, you could consider insulation as another option. If the walls, floors, and rooves are properly insulated, they will trap inside warm air during the winter months and cool air during the summertime. You can also add some of your own insulation with blankets, padding, and other soft surfaces. If you are offering a shelter to cats during the colder months of the year, researching the heating and insulation situation is especially important. Buying a cat house which isn’t the right size is a waste of money, so you should make sure that your feline friend fits inside comfortably. If you are unsure, it is worth going for a larger size rather than a smaller one to ensure that they have enough space. 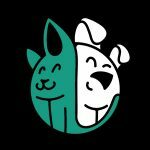 You are bound to need a bigger house if you have multiple pets who will be sharing the structure. Having said that, you should still remember that larger houses are more difficult to heat than smaller ones, and they also present greater cleaning challenges. These two factors go hand-in-hand and contribute toward your cat house standing the test of time. Don’t forget that your cat is likely to bite and scratch at the surfaces, which can end up damaging them. Reliability is based on a solid construction with joints which fit tightly together. For a better indication of durability, check the product reviews to see what other cat owners have had to say. You may find out some information which was not already apparent. Some of the products above also advise that they are not suitable for cats who are more destructive, so this is another point which is worth bearing firmly in mind. Closely linked to the previous section, it is worth knowing a little bit more about how long your cat house is likely to last. Of course, the vast majority of people want this to be a long-term purchase and dp not want to keep buying a new one time after time. Many products have some sort of guidance on this subject, and others include a warranty which gives you an added guarantee. You could look in more detail at what sort of protection they offer against mold, water, and any other substances which could cause an issue. It is likely that you are going to need to clean your cat’s home from time to time, and you don’t want your job to be overly complicated. If the design features some cushions or another type of bedding, it is easier if they are all washable. If you want to make things even more straightforward, you should select a house which has a removable roof or floor. Over time, you may need to conduct some repair or maintenance work, so it is worth knowing a little bit more about what this may entail. Do I Really Need an Outdoor Cat House? If you have an outdoor cat, buying them a home is a worthwhile investment. When the cold of winter sets in or the rain starts pouring, it is important to provide them a place where they can get some shelter. Alternatively, you may be looking to offer a sanctuary to any stray or feral cats which are in your local area. Or perhaps you have a cat who passes between the indoors and the outdoors, but you would like to offer them a spot to rest outside. Many felines love to have a place of their own to shelter, sunbathe or simply explore. All of the options in the product guide above which offer a combination of one or more of these different qualities. But the weather isn’t the only threat to your feline friend. Other animals can also pose a risk, which is why so many of these houses come with dual openings to provide an easy escape. Other harmful factors which feral cat shelters can protect against include fleas, insects, and mold. Many are made of materials which are specifically designed to defend against these issues. As you will have been able to tell from the above buying guide, there are several different types of cat houses available. Here are some of the main differentiating features which can help you to make your mind up. Some of the cat houses above only have the capacity to hold a single cat, while others are big enough to contain several. Obviously, your decision will be based on how many felines you want to provide a shelter for. As we mentioned earlier on, it is worth taking your cat’s measurements to ensure that you select one which is the appropriate size. Of course, all the cat shelters above promise outdoor usage, but some withstand the elements better, while others are better kept under a roof or another similar structure. For example, the wooden houses are generally the ones which do well in any conditions. Many are made of anti-rot wood with the assumption that they will need to withstand a lot of rain and/or snow. Others are made from simple fabrics, which make them suitable for indoor use, and outdoors if they are under a shelter like a porch. Obviously, everything comes down to where you plan on putting the cat house. While some outdoor cat homes don’t come with any heating features at all, others are electrical or self-heated. Obviously, electric houses require a power source and electricity to function effectively. You also have the option of using these models without electricity if you would like. As for self-heated houses, they are made from insulating materials which keep your pet warm or cool, depending on the season. Of course, electrical houses have the potential to be warmer, but they don’t have the convenience factor of being able to put them anywhere you like. A: Encouraging your cat to use their cat house can present some challenges at first. Your first task is to make sure that you position the structure in the right place. The front should face away from the wind, and it should be in a location which protects against the rain and snow such as under a porch or some trees. If you can choose a place which has some sunshine and a nice view, this is always going to be a bonus. If you are planning on using it for feral cats, a discreet location is best as this is less likely to antagonize your neighbors who may not agree with keeping them. Cats also prefer an area where they can get some peace and quiet. Some shelters are best not directly on the ground as this will make it colder and more likely that other wildlife will be attracted. You could use pallets or bricks to prop it up. Cats also like heights because they feel more secure and protected. Patience is key when it comes to encouraging your cat to use their shelter. Make sure that everything is clean by washing any cushions, blankets or bedding beforehand. You could also make the shelter more alluring by spraying it with catnip. 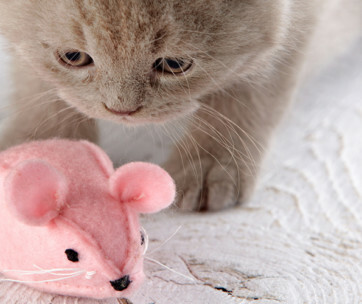 If you own the cat, you could put some of their toys and their scratching post inside to get their scent inside straight away and offer a sense of familiarity. You may need to leave them inside for some time before the smell becomes obvious. Your cat will probably start to explore slowly and cautiously, so offer them plenty of encouragement. A small treat can also help, but don’t only entice your cat with food as this can tempt other animals to enter as well. Don’t force your cat to go inside before they are ready as this can end up putting them off entirely. During the winter months, a heated pad will be very tempting to a cat, so let them discover the warmth for themselves. However, when they are asleep, you should avoid disturbing them. Simply allow your cat to get used to the shelter by themselves and they are likely to return when they want another sleep. Q: How do I select the right house size? A: Choosing the right house size is one of the most important considerations when you are buying a product of this variety. Essentially, you want it to be big enough for your cat to comfortably turn 360-degrees, as well as lying down and stretching out when they like. Bear in mind that many cats feel more comfortable in a cozier home. Larger homes are tougher to heat and can also end up encouraging other animals to enter. Of course, if you are looking to provide a place for multiple cats, you will need something bigger. Ultimately, it is worth getting a tape measure to compare your cat’s size to the dimensions of the house. Q: How should I clean my outdoor cat house? A: The cleaning method of your outdoor cat house depends on the type of materials which it is made from. If it contains fleece, woolen or similar soft materials, these can often be put in the washing machine on a gentle and cool cycle, but always check to confirm this. As for washing the rest of the house, you should remove anything you can first before attempting a standard soap and water scrubbing session. Many of these houses feature large openings which make it easier to reach inside and do the necessary cleaning work. Our number one pick of all is this stylish cat condo which is big enough to provide the perfect spot for several felines. The pre-drilled holes ensure that it is easy to assemble, while your cats have the choice of whether they would like to enjoy the fresh air on top or shelter underneath. Either way, they are protected from the rain by an asphalt roof. Made of cedar wood, it is designed not to rot over time. In fact, it should last for a period of at least three years if it is kept outdoors. Ultimately, this is the kind of product that your outdoor cat will love, and it will also look stylish in your garden too.